A German tourist was arrested early Monday following an incident with a Tuk Tuk driver on 25th of July 2011 as 23:45pm. The Tuk Tuk driver says that he picked up a German tourist out the front of Siam TV and took him to the Chiang Mai Ram hospital. 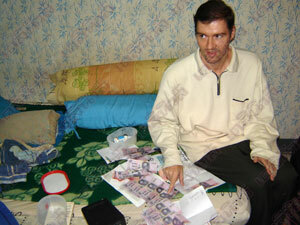 The German tourist known as Simon Fuchs paid 100 baht for the journey and received 400 bahts change in 100 baht bills. The Tuk Tuk driver then went to the nearest convenience store to purchase something with the 500 baht he received. The clerk at the convenience store then informed the Tuk Tuk driver that the bank note was in fact a fake. Furious the driver of the Tuk Tuk driver then went to the police who immediately called on the police radio that there was a German tourist passing off fake 500 bills. At 00:20 am Police posted near Siam TV which is a large electronics store noticed a sole man walking by himself of European decent. Police called the Tuk Tuk driver who earlier had over to identify the man. The Tuk Tuk driver ID'd the guy who was in fact, Simon Fuchs the same guy. Police started following Simon around gathering more intelligence and then on the 8th of August police arrested Simon Fuchs in his hotel and found a bevy of equipment related to the counterfeiting of money. They found 15 fake 500 baht notes, an ink jet printer, 300 baht in fake 100 baht notes, and a pile of A4 papers. Police interviews Mr Simon Fuchs who says that he started making fake 500 baht notes because he was running out of money so he went and bought an ink jet printer and started producing fake 500 baht notes. His first set of fakes were really good he says, so he used them. He didn't have any problems so he started making more. But I told myself I would only use them to pay for transport costs. In the end Simon Fuchs was arrested in the End and could spend many years in a Thai Jail because of what he did. That was pretty quick of the police to catch the guy in what 40 minutes, amazing! Still took them a while to arrest him.